Alison Furness leads the Warriors to a 49-30 quarterfinal win. Sophie Lamb said she and her Wells girls’ basketball teammates didn’t care when they played Gray-New Gloucester. The Warriors had a score to settle after losing at Gray 28-24 on Dec. 19. Playing at 9 a.m. Wednesday because of to Tuesday’s postponements, the third-seeded Warriors were sharp from the start. Led by Alison Furness and Lamb in the tone-setting first quarter and receiving contributions up and down the lineup, Wells rolled to a 49-30 victory over the sixth-seeded Patriots in a Western Class B quarterfinal at the Portland Expo. Wells (17-3) will play second-seeded Spruce Mountain (19-0) at 3 p.m. Thursday in the first of two regional semifinals at the Cumberland County Civic Center. Spruce Mountain beat seventh-seeded Fryeburg Academy 55-51 in its quarterfinal. Lamb is probably the least heralded of Wells’ five senior starters. A forward who sets picks for Furness, works the boards and plays defense, she rarely is asked to score. But she scored the first basket of the game and drew a charge on Gray-New Gloucester’s top scorer, Maria Valente, in the opening minute. Valente picked up her second and third fouls in less than three minutes of further first-half action and never was in the flow, finishing with six points. Knowing Valente looks to attack the basket, Lamb said it was a pregame plan to try to draw offensive fouls. Furness finished with 18 points, 13 in the first half as Wells took a 28-14 lead. Lamb scored the first basket, seemed to be on every loose ball, and scored Wells’ first four points of the third quarter, finishing with seven. Stephanie Woods and Natalie Thurber each had two 3-pointers. Woods hit her second 3-pointer as the first-half clock ticked down. Thurber scored hers in the third as Wells put the game out of reach. 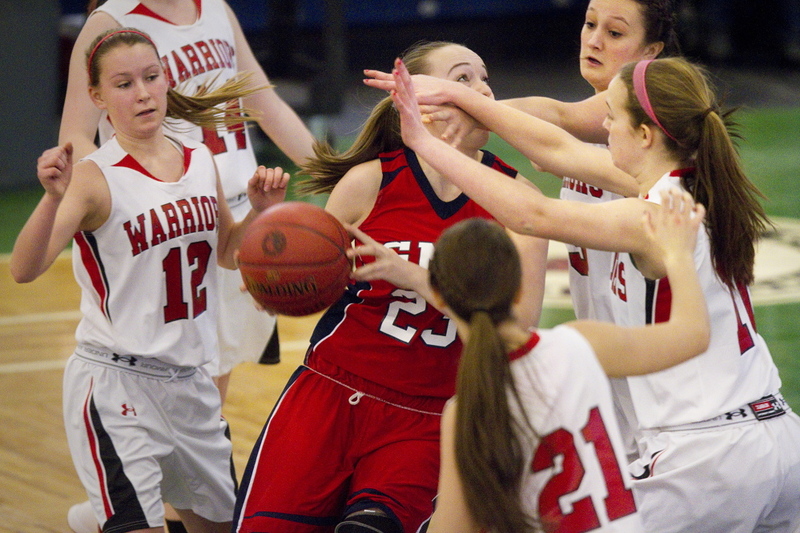 Alicia Dumont had 10 points for the Patriots (11-8). In the fourth quarter, with Nicole Moody running the offense and Furness taking a rare rest, Wells worked on its possession game. One trip lasted nearly two minutes. “We ran into a buzz saw today,” Gray-New Gloucester Coach Mike Andreasen said.